What in the world is UV mapping? For the uninitiated, this seems to be one of the most difficult concepts to grasp, yet it is absolutely critical if any patterned textures are going to be applied to the mesh. But first, before we can explain UV mapping, we need to discuss 3D space. Let’s start with Global and Local. They both use X, Y & Z coordinates, where X is left to right, Y is up and down, and Z is forward and backward. In the viewports, the top viewport looks along the global Y axis, the front viewport along the Z axis and the side viewport along the X. In Gobal space, the center of space is called the origin, and has the coordinates of “0” in X, Y & Z. These coordinates have no relationship to any object and are universal. 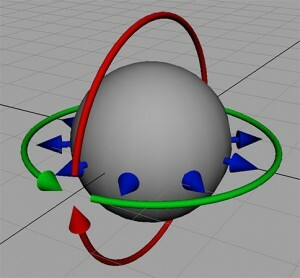 In the image below, the small sphere has coordinates of “-1″ unit on the X axis, “0” units on the Y axis and “2” units on the Z axis. If an object moves in Gobal space, it’s moving along these axes. Local space is based on an object’s orientation. In Local space, if an object is rotated, it’s X, Y & Z axes rotate with it. This space is owned by that particular object, and if this object is moved on the X axis, for instance, it’s going to move to it’s left or right, not the left or right of Global space. 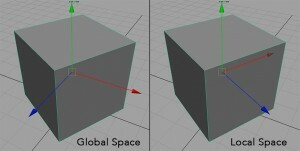 In the image of a rotated cube below, the left image shows the Move tool oriented to Global space, and the right image shows the Move tool oriented to Local space (or Object space, since this space is tied to the object’s orientation). Normal space is different. First, it doesn’t use XYZ coordinates. It uses UVW coordinates. If you think of a globe of the Earth, the direction of the latitude represents the “U” axis, the direction of the longitude represents the “V” axis, and elevation represents the direction of the “W” axis. In the image below, green represents the “U” axis, red the “V” axis and blue the “W” axis. 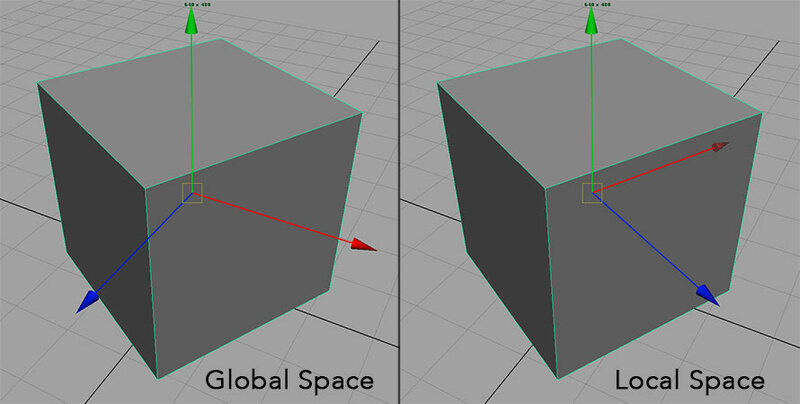 In both Global and Local space, the directions of the axes are constant; in Normal space, the direct of each axis changes as you move across the surface. 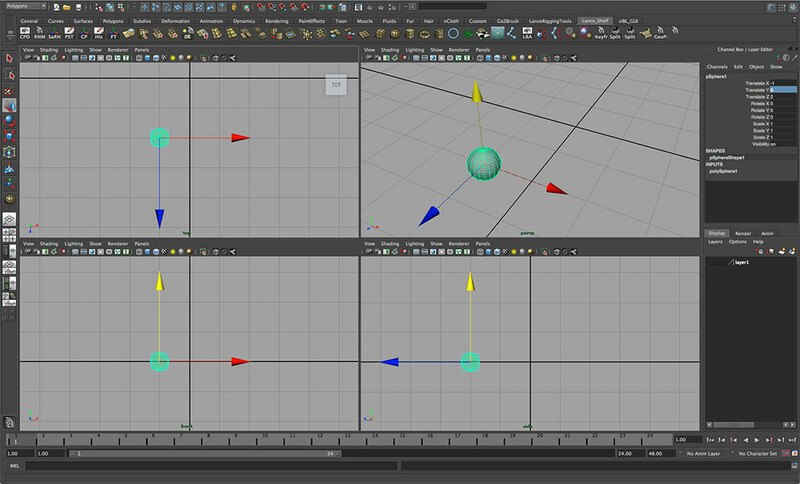 In essence, UV mapping takes coordinates in 3D space and converts them into coordinates in 2D space. Think of taking a globe of the earth, with latitude and longitude lines on it, and unwrapping the 3D surface until it fits into a 2D image; like a regular flat map of the earth with longitude and latitude. This process distorts the surface in order to get it to fit. Landmasses become bigger East to West the further North you go. UV mapping is the same thing. It takes a 3D shape and converts it into a 2D map, resulting in similar distortions. And it does this using the U & V axes; the U axis is similar to latitude and the V axis is similar to longitude. 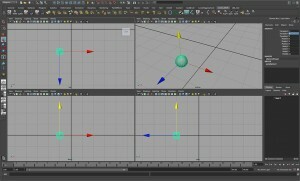 In the image below, the mesh on the left has been UV mapped on the right, where the 3D coordinates of each point on the surface and been assigned coordinates in 2D space. This process is sometimes called “pelting” because it’s similar to removing the pelt from a 3D animal and turning it into a 2D rug.